I have been doing radio for the past couple of years. I decided to do a radio air drop to receive feedback on how I sound on the radio and if there may be any room for improvement. When I began working on this project, the software used was Logic Pro X while putting this project together. I used IMovie to convert the .MP3 into a .MP4 and I wrote my script on Microsoft Word. I have been writing for many publications and websites for years now. I wanted to submit an interview that I held with Shady/Aftermath's Super Hip Hop Group "Slaughterhouse". 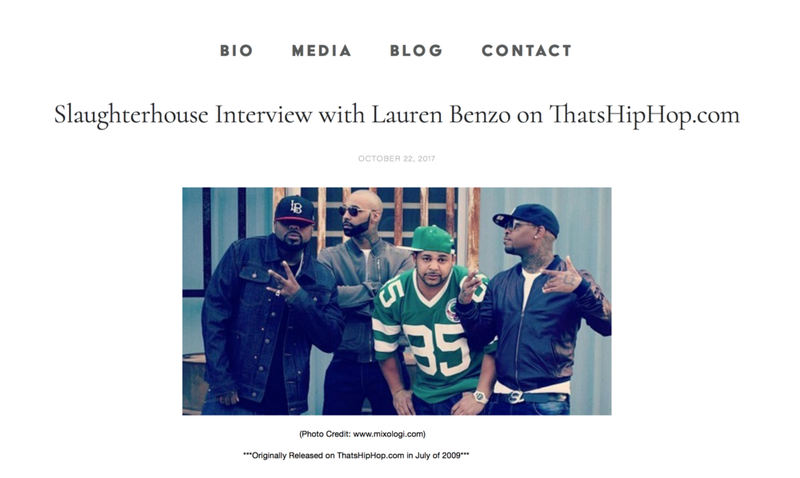 The resources utilized for this interview was a tape recorder, Microsoft Word, and WordPress. I have been doing radio for many years now and I had the idea revamp my radio show into a music video television show. My sister Monica, my cousin Sophia, and myself grabbed a camera and shot footage in all the 5 boroughs of New York City. We were also able to contact hip hop artists in the area and interview them. After we finished taping, I grabbed some previous footage that I had from covering events and I started the post editing adding effects, voice over music, and actual hip hop music videos from the likes of SlaughterHouse, Lupe Fiasco, Notorious B.I.G. and more. I am not actually ready to release all of the pilot, but I wanted to submit a snippet to give you an idea of what I have been working on. While working on this pilot, I used a cannon XA10 HD Professional Camcorder, Adobe Premiere, Itunes, and Adobe After Effects. I would also like to add that the co-hosts of this pilot were Monica Benzo and Sophia Twillie. This project was based on a pilot for a travel television show with hip-hop flair. This show will be called "Food Traxx with Benzo". I really would love to see this project become a reality. Everyone knows that the culture is Hip-Hop is taking over world. I want to open the eyes of viewers that think the culture is only about a person "rapping". When you think about it, hip-hop is everywhere. From fashion, to music, to Hollywood, even in homes in Idaho. The outcome would be monumental! Imagine the feedback that this show would bring to the table. Especially knowing that this will be an originator and many people will try to imitate this idea in the future. When I began working on this project, the software I used was PhotoShop for my logo, Microsoft Word to type out my proposal, and Microsoft Excel to work on my project budget. I have gotten my feet wet in the world of freelance journalism. I chose to submit a post that I did for one of the websites that I work for. The post I chose to use for this submission is a mini write-up on a hip hop artist from Milwaukee, WI and his name is Vincent VanGreat. 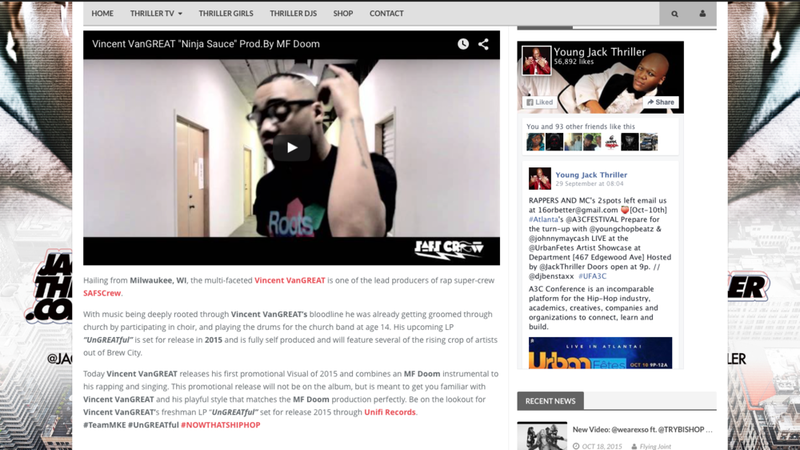 The resources that were utilized for this posting were an Youtube embed music video of "Ninja Sauce", Vincent VanGreat "Ninja Sauce" music single photo, hyperlinks, JackThriller.com Wordpress Site, Google research sources on artist, a write-up done by Lauren Benzo, and hashtags. When I was in my OVA course and I learned many things about the entertainment industry and myself. In our last week, my instructor wanted all the students to make a slide show about what our dream job would be and what goals we would make to get to the dream job in the matter of 5 years. When I was in the New Media Tools course, I learned how to become a “visual storyteller.” It was not simple, because I was learning how to work with programs that I never touched before. During my last week in this class, I attended the GTT class and spoke to my instructor about everything I learned and what goals I was setting for my future. During the middle of the class, she gave me 40 minutes to make a video that included music, imagery, and a voice over. I told her that I wanted to make the video about something that I am passionate about.. which is Hip Hop and the 5 elements of the culture. So I chose to do a type of PSA about a forefront of hip hop that was painted over and became condos in Long Island City, NY. The resources that were utilized for this video were personal photos, IMovie, Microsoft Word to prepare the script, “Walk With Me” by Raekwon with production by Scram Jones, and YouTube.